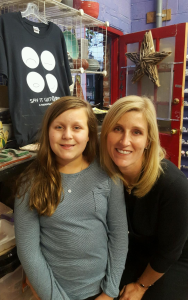 For 11-year-old Haddonfield resident Caroline Deegan, 2014 was a tough year. She and her three siblings were being raised by working single mother Susan, and things started to get tough at school in fifth-grade. “Caroline would come home from school and it was a matter of making a connection in a limited time space — after I got home from work and before bedtime — and she wouldn’t talk,” said Susan. Susan and Caroline started frequenting Say It With Clay (SIWC), an art therapy non-profit in Collingswood, and Susan says she saw a dramatic change in her daughter over several sessions. Together, they made bowls, warming mugs, ornaments and other gifts, and Caroline even held her last birthday party there. But the best part, according to Susan, is her renewed relationship with her daughter. Teens and parents struggling to find common ground can soon participate in a formal program geared to copy Caroline and Susan’s results, thanks in part to two $1,000 grants to SIWC from Investors Bank in partnership with the Roma Bank Community Foundation. SIWC provides an alternative, holistic therapy program designed to help relax and motivate children and teens. Reconnect will be a free, eight-session program in which teens and their parent/guardian complete projects specifically designed for them. After a relationship assessment with a licensed art therapist, the teen and parent/guardian pair will work on issues such as trust, anger and happiness through enjoyable therapeutic projects such as memory tiles and a set of dishes. Kasoff, who specializes in adolescent therapy, believes the new program would be beneficial for teens with a range of issues, such as teen mothers and runaways. SIWC applied for the grants from the Investors Foundation and Roma Bank Community Foundation; Roma Bank became part of Investors Bank in early 2014. The Foundation supports non-profit organizations that enrich diverse communities served by Investors Bank. Creating projects with clay enables the parent and child to feel a sense of ownership and accomplishment in SIWC’s intimate and personal atmosphere. Seeing their completed projects helps participants build self-esteem and confidence. After “creating” time with clay, the parent and child always speak about their project in “sharing” time. Kasoff stresses the threat-free environment that creates an equal playing field. SIWC still is looking for additional funding to begin running the Reconnect program. 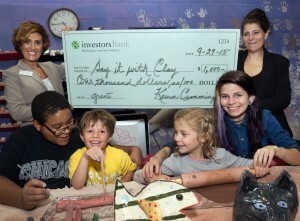 For more information, or to donate, contact Abbie Kasoff at (856) 816–7458 or abbie@sayitwithclay.org.